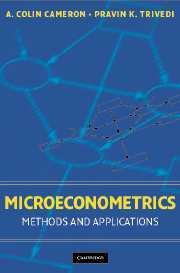 "This book presents an elegant and accessible treatment of the broad range of rapidly expanding topics currently being studied by microeconometricians. Thoughtful, intuitive, and careful in laying out central concepts of sophisticated econometric methodologies, it is not only an excellent textbook for students, but also an invaluable reference text for practitioners and researchers." "I wish "Microeconometrics" was available when I was a student! Here, in one place -- and in clear and readable prose -- you can find all of the tools that are necessary to do cutting-edge applied economic analysis, and with many helpful examples." "Cameron and Trivedi have written a remarkably thorough and up-to-date treatment of microeconometric methods. This is not a superficial cookbook; the early chapters carefully lay the theoretical foundations on which the authors build their discussion of methods for discrete and limited dependent variables and for analysis of longitudinal data. A distinctive feature of the book is its attention to cutting-edge topics like semiparametric regression, bootstrap methods, simulation-based estimation, and empirical likelihood estimation. A highly valuable book." "The empirical analysis of micro data is more widespread than ever before. The book by Cameron and Trivedi contains a superb treatment of all the methods that economists like to apply to such data. What is more, it fully integrates a number of exciting new methods that have become applicable due to recent advances in computer technology. The text is in perfect balance between econometric theory and empirical intuition, and it contains many insightful examples."